Yesterday I wrote about being in the present moment, and quoted Lao Tzu on Presence being the way to obtain peace. My summary was to neither worry about the past or the future, but to recognise the opportunities that are unfolding now. 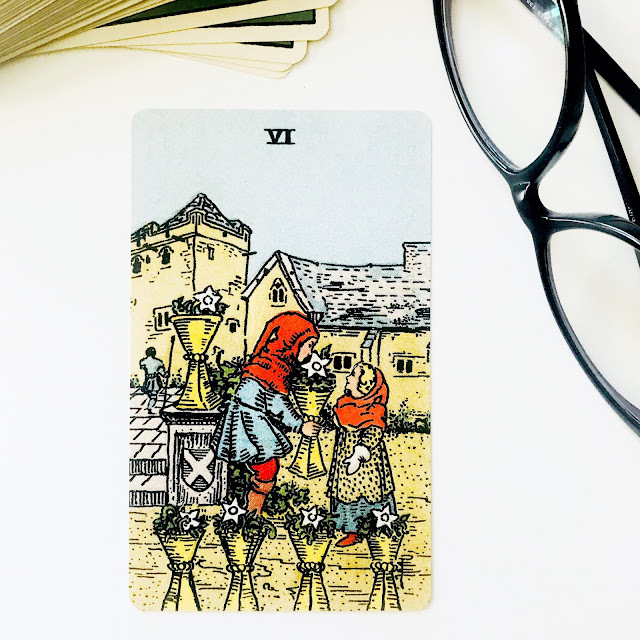 Today's card takes that conversation a step further with the Six of Cups reminding us how we influence that unfolding. This card has a nostalgic feeling and is typically interpreted as relating to fond memories, childhood, rekindled friendships and reflecting on good times. It's a card of comfort and security. So how do we combine a card so clearly about the past, with the need to stay in the present? Why is [Now] the most precious thing? Firstly, because it is the only thing. It's all there is. The eternal present is the space within which your whole life unfolds, the one factor that remains constant. Life is now. There was never a time when your life was not now, nor will there ever be. Secondly, the Now is the only point that can take you beyond the limited confines of the mind. It is your only point of access into the timeless and formless realm of Being. - Who or what are you drawn to at this time? - Who or what is being drawn to you? - What does that say about your vibe and the likely impact on your "future"? - How are you Being in the eternal now?